The cottage is set in idyllic natural bush setting, where you can hear the Kiwi calling and see the Weka in the garden. The cottage is self contained and has safe off-street parking. It's just a short pleasant stroll to the Russell waterfront and to the centre of historic Russell. From here you can visit the Museum, Pompallier, the oldest surviving church and the Bay of Islands Swordfish Club (the second oldest fishing club in the world). The tennis courts, the Bowling Club and the boat ramp are just around the corner. Had a lovely week here with our daughter. Five minutes walk to Russell high street and beach but still quiet and out of the way. The house is in a small valley so its in shade when the sun rises and sets. Actually not a bad thing during hot days. Loved this accommodation. Spotlessly clean, comfortable, everything we needed. Only a few minutes stroll from the middle of Russell. Choice of good beaches 5 minutes away in the car. The photos don't do it justice. Get the ferry and visit the Waitangi treaty grounds for a thought provoking day out. 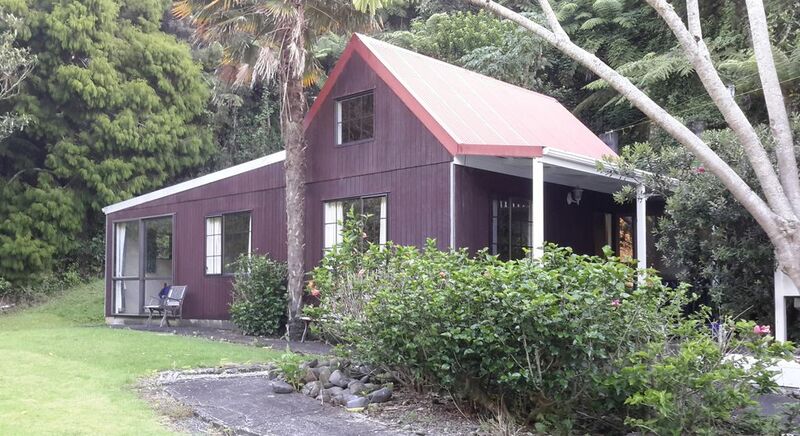 Comfortable well equipped Bach very near the centre of Russell but in a lovely quiet bush setting. Dianne and Ross were very welcoming and helpful, and we had our towels changed every couple of days! Russell is a lovely town....we enjoyed particularly our day sailing on the Tucker Thomson tall ship, a visit to Waitangi on Waitangi Day and walking over to Long Beach. We can thoroughly recommend this little house. Had a wonderful holiday. Cottage had new carpet and a lovely cosy feel. Bush setting with kiwi and weka calling in the night, and only 2 min walk to the beach and bars. Wonderful hosts who gave us plenty of info about the area. Looking forward to our return trip. Cute, clean, and close to town. Was the perfect size for us, good clean facilities, loved how close it was to Russell town centre. Would highly recommend! Great guests. Left the cottage very clean and tidy. Thanks. Highly recommend these guests. We came here with our two young girls and found the property to work great for us. The cottage is simple, clean and warm. Comfy beds too. It is easily close enough to Russell to walk anywhere and there is a big lawn outside for the kids to stretch their legs. Great to hear the kiwis calling in the night and see other native birds flying through the bush.